When speaking of aerial videography, you would be forgiven if your mind jumped to picturesque landscapes and beautiful sunsets. But, while drone videography and photography excels at this style of aerial video, it isn’t by any means limited to it. An aerial videographer with enough skill (more on this later) can use an aerial videography drone to capture incredible aerial video photography of important events in your life. And, in doing so, offer the unique perspectives and angles that only aerial video can allow. With aerial videography rates being as reasonable as they are, this opportunity is one that should be snatched up. 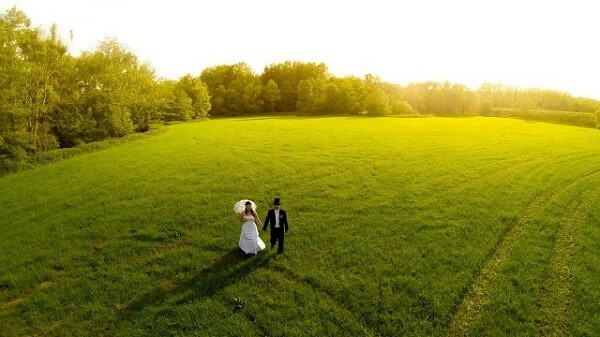 But, if you need a little help imagining the possibilities of drone videography and photography, here are a few examples of how an aerial videographer can completely transform your idea of photographing special occasions. Traditionally, the special wedding video set-ups featuring the couple alone require the couple to be moving while the camera stays still. Also, since the camera is operated by a person, the height of the angles is limited to the height of the videographer. However, aerial videography through the use of a drone allows the couple to stay reasonably still while the camera does the work. Imagine long sweeping shots which capture the grace of the bridal couple and amalgamate it with the beauty of their surroundings. This is entirely possible at very affordable aerial videography prices. Sometimes parties are thrown simply because it’s time to have a party, but other times a truly special occasion demands one. On these occasions, having a video to remember the significance of the occasion is a wonderful idea. Imagine having a view from above that is able to capture the spirit of the party and highlight the incredible decorations all at once. Again, this is possible through very reasonable aerial videography rates. A video shot from one angle doesn’t do any justice to a live performance, or honour the intrinsic flow of music being performed specifically for videos. However, height and movement are the perfect visual accompaniments to music, and getting these shots via drone is far more advantageous than using a crane. So, to make your special occasions truly incredible, contact DroneSnap today. With excellent aerial videography prices and expert aerial video skills, you’re sure to create a lasting memory to be proud of. And, speaking of skills, as promised, the following video shows exactly why you want an expert aerial videographer to take the reins on your special day. Enjoy!